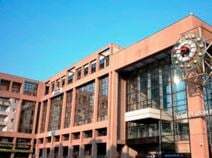 This centre offers a prestigious location in Lyon with easy access to road and railway routes, the city centre is close by and well serviced by a choice of good quality hotels and restaurants. Clients are offered flexible terms and can choose to rent from a few hours up to long term contracts. 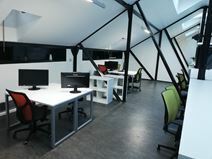 The recently built centre is well equipped and furnished to assist in creating a comfortable working environment. This fantastic workspace solution is a beautiful, modern centre flooded with natural light and possessing a large, stunning conference auditorium and a variety of office spaces. The property also boasts showers, a restaurant and ample car parking facilities for your convenience. Situated near to central Lyon in the Outlines area, it is minutes from the local rail station and close to the riverside. An eye-catching modern building with a huge range of facilities including an in-house restaurant, dry cleaning services, underground parking and dedicated reception and secretarial support. Sited within Le Part Dieu business area, opposite the TGV station and close to the centre of Lyon and to Saint Exupery airport. Just 10 minutes away by foot, you can observe exhibitions at the Institut d'art contemporain. With a peaceful location on the outskirts of Lyon, this business centre is situated in a modern building. Offering functional offices, along with a comprehensive range of services to meet your demands. There is administration support provided on-site, as well as postal facilities/mail handling so that your operations can run as efficiently as possible. It can be accessed from the D306 and A6 road links, along which you can reach the Lyon Salvagny Golf Club. 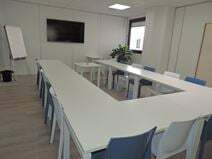 Located in the heart of La Part Dieu business district this centre is within a building related to the TGV station and is only 30 minutes from St Exupery Airport by train. This location is the ideal workspace solution for companies with both domestic and international clients and would like plenty of options within the surrounding area at which to entertain them. There is an abundance of restaurants and cafes on the same block, as well as several hotels all within walking distance from the space. With 24 hour security, you can work with peace of mind. In addition, you can benefit from this centre's copy and printing facilities, complementary beverages, and training rooms. Perfect for medium sized companies, these sleek, 6th floor offices are housed within an impressive tower building. There is a large conference room and the office space is mostly open-plan with flexible servicing. Located in the Part Dieu business district, the property is close to TGV station and central Lyon's many amenities. Within 5 minutes, you can reach a concert hall, museums and various event venues where you can host networking events that are sure to impress. 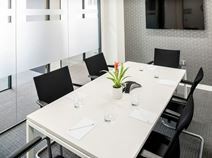 Located on the two Executive floors of a famous tower in Lyon, offering a marvelous 360 degrees-view over Lyon and its surroundings (including the Alps), this centre provides a unique experience to its customers, thanks to the comfort, confidentiality and efficiency deployed for good meetings, mails management or reception of visitors. his business center stands as a perfect place to gather different business networks, and also hosts some Clubs or Clusters, coming to attend meetings in this place. This business centre is conveniently located close to schools, restaurants, shops and public transport links. The centre provides a comfortable and stylish place to do business, with on-site support services that will enable your business torun efficiently. The space is topped with a glass dome to create a light and inspiring workspace solution. In addition, there is private parking in the basement for your convenience. The immediate proximity of Perrache station and Lyon's hypercentre city makes La Confluence an attractive and dynamic economic district, which has been acclaimed by many brands. This business center and its perfect location offer you all the amenities you need to increase your own business in a wonderful setting. You can benefit from quality furnishings, high-speed internet access, maintenance services and breakout spaces. Overlooking green space in a campus complex, this unique building offers serviced offices in a range of layouts to suit your requirements. The centre is located on the ground floor of Campus Verrazzano. It is extremely easy to access, and is away from the busy traffic in the city centre. Greater Lyon also attracts creative companies, while Lyon Part-Dieu is the second largest service sector district in France. The centre prides itself on creating a caring community that creates connection and business through increased networking possibilities. Accessible 24/7 this space is well suited for any kind of business hours. Here, you can also make use of the on-site meeting room and catering can also be provided. There are also many telephone boxes and confidentiality spaces that you can use to make private phones calls. Relax in the many break out spaces or get some fresh air on the terrace! This atypical business center in a historical building will provide you all the amenities to ensure you the best work environment. The meeting rooms available on request are all equipped and ready to host your meetings and presentations. In the heart of Lyon, you will enjoy the location near a lot of transport links metro, buses, TGV etc. and a lot of shops, retailers and restaurant perfect for a short lunch or a lunch with clients. These furnished offices are located in the high speed train TGV station, along with private parking. The convenient location makes it a great working environment to do your business. The space is accessible 24 hours a day so is well suited for any kind of business hours. Being located in a Train Station means commuting to and from the space is exceptionally fast! There is also on-site parking that is secure for your peace of mind. 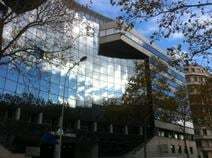 This modern building is strategically located in the TGV Lyon Part Dieu Station and next to the Part Dieu shopping centre. The centre provides light and fully equipped offices as well as 2 meeting rooms, video conferencing facilities and secretarial services. The site is well equipped with AV equipment so that you can be prepared for presentations and demonstrations. There is also a concert hall within 10 minutes walk. 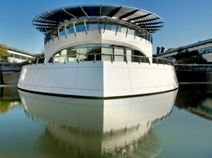 This motivating work space is located in Lyon, on the banks of the River Saone. It provides excellent facilities which businesses of any background can enjoy, such as meeting rooms, support services and postal/mail handling. It is accessible 24-hours a day. It is also close to lots of public transport connections and many local amenities, such as cafes and restaurants. There is also parking available on the street for easy access. This centre is well situated in central Lyon, with plenty of professional amenities to be utilised as your business develops. Here, there are spacious meeting rooms, conferencing facilities, communal kitchen areas, administrative support and break-out rooms. The centre is also accessible 24-hours a day which makes it an ideal place for conducting business with overseas clients. The area is well connected through public transport, with the local train station situated on your doorstep. The Airport is also a short distance away, allowing your employees to manage global relationships with ease. Local amenities are also numerous and include hotels, restaurants and bars all within a short distance from this prestigious business centre. Located in the city centre of Lyon, this business space offers a range of stunning office solutions. Spread across 2 floors, you can choose from a range of work spaces in varying sizes - this is the ideal space for any size team or organisation. The space is designed for maximum comfort, providing meeting rooms, break lounges and a kitchen. The local area offers a range of great amenities, including eateries, shopping, supermarkets and plenty of public transport links. This striking building provides a professional working environment offering bright and spacious office units with good insulation and air-conditioning systems. Just 2 minutes’ from the TGV station the centre boasts a prestigious address surrounded by big company names and a range of facilities including a shopping centre, parkland and a leisure facilities. Just a short drive away, you can reach the beautiful Lyon Botanical Garden. Smart contemporary office premises which are ideal for a range of companies and which offer reception and secretarial services. Beverages are provided so that you can recharge and stay motivated throughout the day. The centre is in Lyon's premier business district, a short walk from TGV and local transport links and close to Saint Xupery airport. Within the immediate area, there are lots of hotels and car rental agencies for the convenience of your visiting executives. This is the perfect workspace solution for any forward-thinking company. This space prides itself on creating a caring community that creates connection and business, with both serviced offices and co-working space in a prime area of Lyon. Here, you can also make use of the on-site meeting room with catering, attractive breakout spaces and 24/7 access. Within walking distance, you can reach public interest spots at which to entertain clients and colleagues alike, such as museums, concert halls, and sports complexes. Lyon Train Station is a short 8-minute walk away and the Underground Station is only 10-minutes away. This office centre is situated on the easy Eurexpo Lyonnais area, just 5 km from the airport. The Center can also be accessed by bus, with the 76 bus line. Many hotels and restaurants are nearby, and the centre offers light and spacious offices, available immediately. With professional reception staff, telephone reception, mail management, secretarial service and access 24 hours a day, 7 days, your business can operate as efficiently as possible. With a plug-and-play set up this flexible workspace is strategically located in the heart of the Charpennes, close to the business district of Part-Dieu. Multilingual on-site staff are available to support your business while private parking is also available. This centre also offers beverages to keep you focused and motivated throughout the day, as well as IT support to ensure you remain well connected. Just a short drive away, you can reach the Parc de la Tête d'Or, which houses Lyon Zoo and the wonderful Lyon Botanical Garden. Conveniently situated in peaceful surroundings, on the outskirts of Lyon and close to beautiful parkland, this centre offers fully equipped and serviced offices as well as meeting and virtual office facilities. The offices have 24 hour access and are well located for tram and metro routes into Lyon city centre. Nearby, you will find historical landmarks, museums and a variety of leisure facilities. Conveniently sharing a building with the Part Dieu TGV station, this well connected centre has a large range of bright offices and meeting rooms available which would suit small and medium sized companies. Car parking is available and this is the perfect business address in a thriving area close to central Lyon. Less than 10 minutes away by foot, you can reach a shopping centre, which houses quality shops, restaurants and cafes. Situated only minutes from the train station and airport and with easy access to a wide range of facilities, this newly renovated business centre is located in highly sought after premises and offers serviced offices and co-working space for all business types and sizes. These open plan offices also come with parking onsite. Close by, there is a shopping centre, lots of restaurants, cafes, bars, a gym, several government offices, and performing arts theatres.